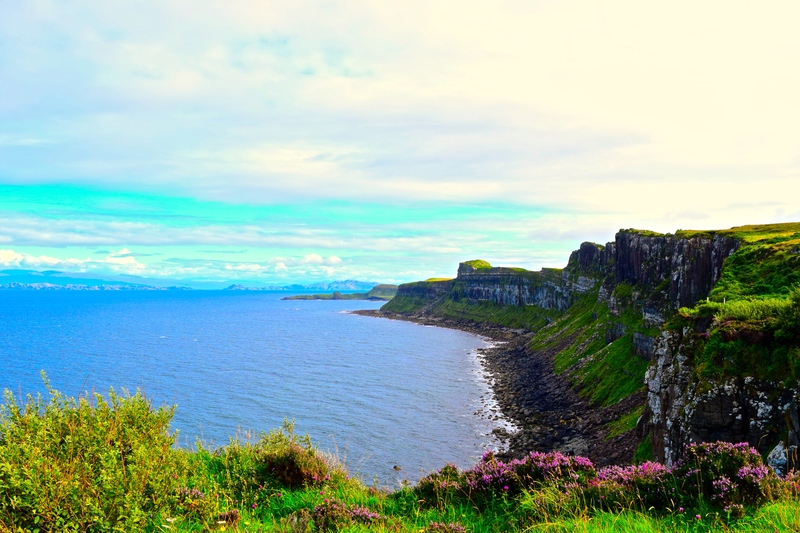 I left the enchanting city of Edinburgh to escape into the Northwestern side of Scotland and venture into the Isle’s, the area of Scotland that I was excited to see most. I had a Pinterest board filled with images from this fabled land and couldn’t wait to explore it for myself at long last! I spent most of the day on a bus, traveling straight North to Inverness where I transfered and took another bus along the edge of Loch Ness. I kept my eyes peeled out the bus windows, just in case I caught sight of the ever elusive and mythical Loch Ness monster! (Just in case you were unaware… loch simply means lake, and there are loads of them in Scotland!). Sadly, the beast never reared her head and I was left to ponder her existence. 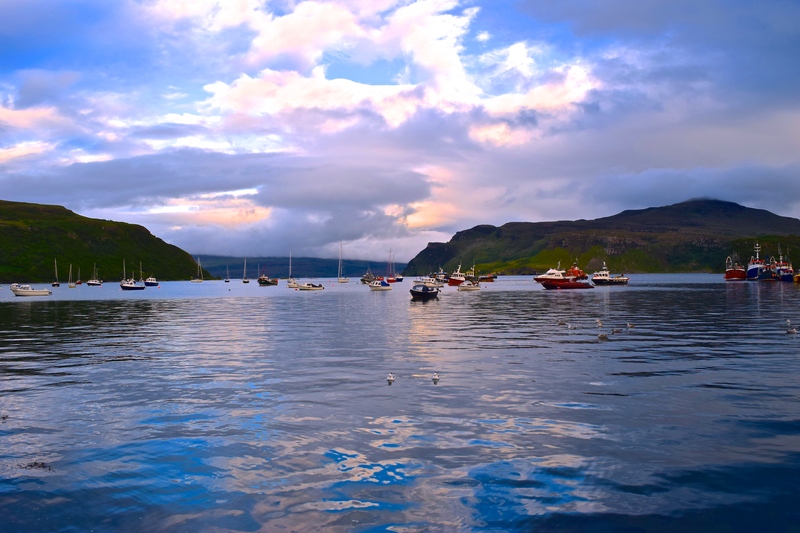 In the later afternoon I arrived at the Isle of Skye, which is connected to the mainland with one large bridge near the main town Portree, but can also be reached in the south by ferry. Rebecca had told me that folk up in the isles were wonderfully kind and not to hesitate to ask for help if I needed it. Being cheap, and assuming a cab (if they even had cabs in this tiny town!) would be exorbitantly priced, I loaded up my heavy bags on my back and went in search of my hostel. After 20 minutes and no luck I started walking back to the town centre and resigned to get someone to help me find a cab. I had barely started back when a car pulled up beside me and an old friendly man asked, in his charming Scottish accent, “Are ye lost, luv?” I sheepishly admitted that I was indeed, and couldn’t find my hostel. After attempting to pronounce it to him and failing miserably, I showed him my reservations and his eyes lit up with recognition. “I know the place! Listen, you sit yourself down here, take a rest, I’ll be dropping these folks off up the road and will come back for ye. Take a rest, please! I’ll be right back”. I thanked him profusely and took my bags off, my back sagging with relief, my shirt soaked through. I sat a few moments, had a chat with a fellow backpacker who was off in search of a campground and before I knew it the old fellow was back and I loaded my bags into his back seat. Off we went, and he explained that often times people would head up this way and think they had gone too far and come back, but they just need to keep going a wee bit further. He dropped me to my hostel and I thanked him again for his kindness, and was greeted by the owner of the bed and breakfast. There happened to be a mix up in my booking and the owner actually never received my booking- oh no! He had just taken down the sign saying they were booked up as he did have one room left – my room! So I was lucky enough to be able to snag what was surely the last room on the Isle! He was a talkative fellow, hailing from England, his partner from here on the Isle, and they ran the place together, but he was the heart of the operation and the chef for breakfast (and what a chef indeed!). 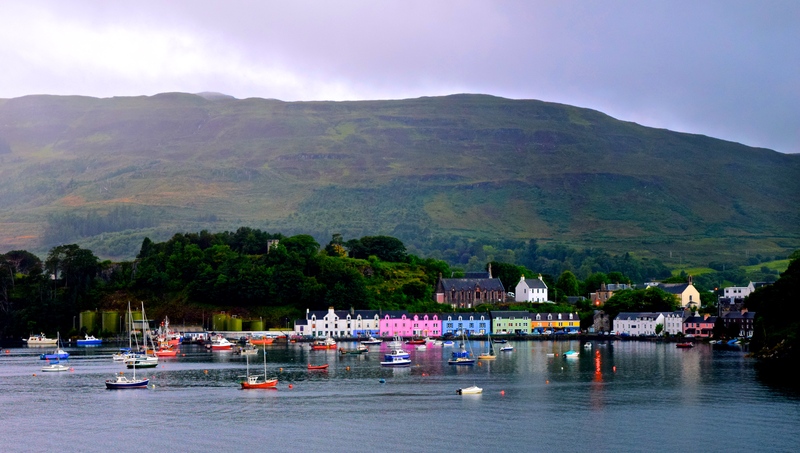 I got settled into my room, and then took to the streets to explore Portree before it got dark. It was too late in the afternoon to get up to much so I explored the adorable little city, and made a reservation for a Faerie tour the next morning! I met up with two other girls at the meeting point for our tour- turns out they had booked the Best of Skye tour, and since there was only three of us, they decided to do a joint tour and combine the two- so we all got a great deal and got to see more than we expected, which was great considering I had a hard time choosing between the two tours. Taking one of these tours is the best way to see the island if you don’t have a rental car. But if you can, I HIGHLY recommend renting a car instead. Not having my original licence (it was stolen in Honduras with my visa), I wasn’t able to rent a car and so had to rely on public transit and tours. Scotland is definitely a country you want to tour around on your own time however. You want to be able to stop wherever you so desire and not be tied to someone else’s schedule. Take my advice on this! Scotland is the most beautiful country I’ve been to yet to date. While the tour I took was amazing, I kept thinking how I wanted to linger longer at some sights and leave sooner from others that weren’t holding my interest as much, but was unable to as it was a time sensitive tour. There is nothing worse than being somewhere and enjoying it and being rushed off to the next stop before you’re ready and before you’ve had a chance to fully explore it. If you do rent a car just beware: The roads in Scotland, and especially the Isles are tiny and often one ways with little turn outs for oncoming traffic to be able to pass. Do NOT attempt to pull off the shoulder of the road however- it rains nearly daily in Scotland and so the shoulders of the roads are like quick sand and you’ll likely find yourself sinking off the side of the road! Our tour started out at the Faerie pools. It was a short 15 minute hike into the stream where began a trail along the water side with several waterfalls along the way. The scenery was spectacular. The clouds were hanging low and heavy but the rain had stopped. Occasionally the sun would peak his head through and display his glorious light on patches of grass and mountain, teasing us with his warmth. I hiked as far up as I dared with our time restrictions, but the path kept going as far as I could see. This was the first of many frustrations of the day at not being able to take my time and explore this remarkable place at my own pace. 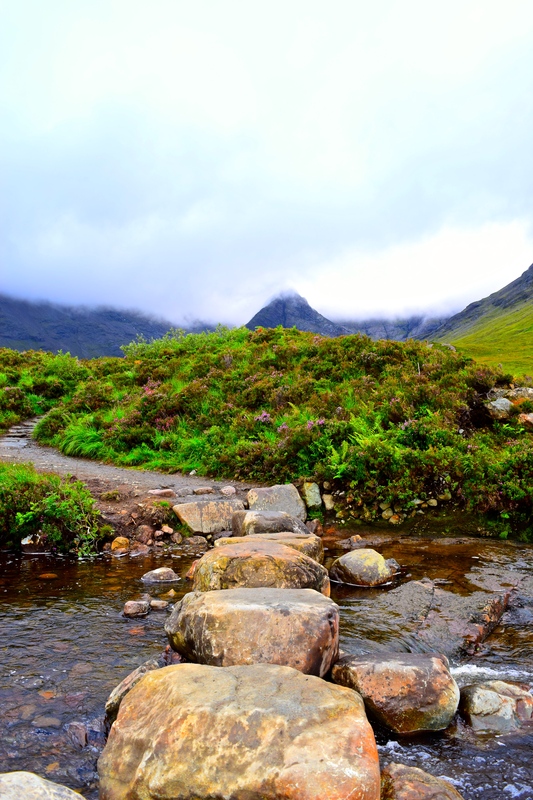 There is no doubt as to why Scotland is bathed in folklore – the landscape brings to mind images of faeries bathing in the pools and waterfalls, flitting out from behind dripping leaves, or down from the heavy mists that surrounded the Black Cuillin mountain range. A perfectly shaped mountain lay straight ahead of the streams, standing like a sentiel, strangely silent, as if watching guard over the faeries below. The dark lumbering clouds shrouded the mountain like a veil, and a gentle mist began to sprinkle down. I dreaded leaving this serene place but I didn’t want to get left behind so I lingered until the very last moment and practically ran the whole way back. We drove off and I left damp and panting, but feeling full of energy from the beautiful place we just explored. 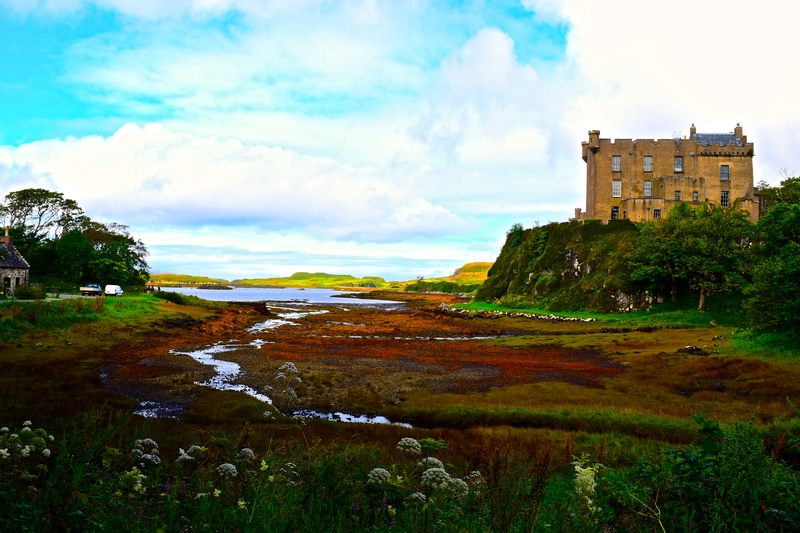 Next on our list was a long drive through the countryside to reach Dunvegan Castle – my first time in Castle! It wasn’t the biggest, oldest or most remarkable of Castles in Scotland (this country has so many!) but it is the oldest continuously inhabited castle; the MacLeod clan still reside their today, as they have for the last 800 years! But what intrigued me the most was the Faerie flag that was framed and hung in one of the great rooms. The flag has many rumoured histories, one that it was a gift from a departing faerie lover to the clan leader, and it is believed to hold special powers available only to the MacLeods. But most impressive for me was the beautiful view of the Castle from afar with the surrounding landscape as the fall colours began to expose themselves. While it was interesting to go into the castle, it surely didn’t look 800 years old inside since the current family still inhabits it (though they live upstairs, where visitors are not able to go). I suppose I was expecting more of an old abandoned castle that was in ruins! We lingered here longer than we would have liked and were anxious to get on the road and eat our lunches that we had brought along to head to our next stop which was an hour drive away. We were off to see the Faerie Glen! Towards the bottom right, you can glimpse the Faerie Rings! I was immediately taken with the place and starting running all over like a little kid in a candy store. I climbed to the highest point to get a view of the surrounding area. There was a small lake in front of me, far off to the distance was a massive waterfall hammering down, but seemingly silent from where I was standing. Sheep only a stones throw away were grazing on the green grass, and the rain held off and the sun came peaking out from behind the curtain of clouds. This place was magic and you could feel it. There was something in the air that made you sure that any moment you would see a faerie peeking from behind a rock, their wings a fluttering blur as they zipped away to hide. I wanted to spend all day in this place, wandering through the rolling hills, chasing after sheep and invisible faeries. I cursed inwardly that we had spent so much time at the castle when we could have instead been here! Our time was limited and we were ushered off, after having already stayed longer than we were allowed. I climbed reluctantly back into the van, forehead pressed to the window as we drove off, a sadness in my heart at having to leave so enchanting a place. 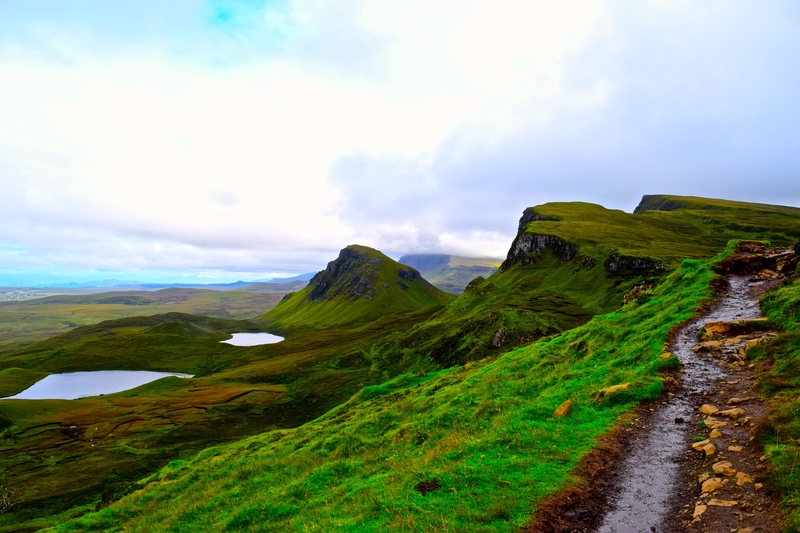 Our next stop was to the opposite side of the island and to cross the mountains to Quiraing to see the famous Trotternish Ridge. The landscape changed drastically and it was profoundly dramatic. The mountains peaked in jagged points and rocks tumbled down to settle at their bases. The vibrant green grass the covered the open spaces and rolling hillsides stood out in stark contrast to the churned up rusty red earth that laid a path for hikers to follow. The dark mountains fell away to the soft rolling hills, and the green hills faded away into vast green pastures with shining lakes that eventually spilled into the sea. The turquoise blue sky peaked out in patches from behind the huge, bulbous white clouds. 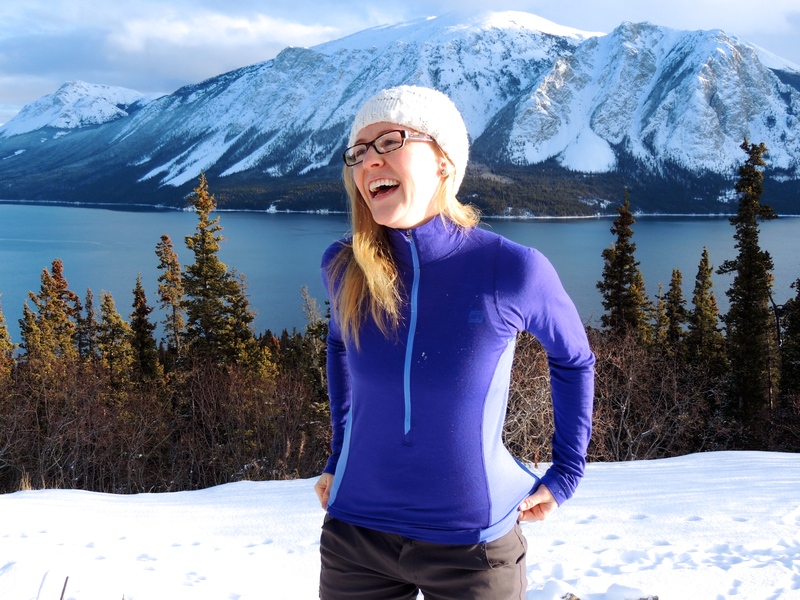 I began hiking up the red path, my heart pounding, not just from the climb, but from the excitement the beauty around me was eliciting inside of me. I was having one of those moments where I couldn’t believe I was in a place this striking. I was in absolute awe. I cursed inwardly again that I could not linger here and hike to the whole way to the top. I hiked as far as I could and sadly trudged back to the van. I easily could have spent a whole day exploring the hiking trails here. Reluctantly ushered back to our van once again, we continued on and were lucky enough to get to make a side stop to feed some sheep! A local crofter (someone who has a herd of sheep) had only a few sheep and to help pay the bills his partner made beautiful hand knit items from the beautiful wool of their prized sheep) greeted us at his little shop and brought out a bucket of feed and led us to the fence where his animals were. As we made our way there, the sheep knew it meant food time and so they all began galloping over, with a flock of frazzled chickens following on their heels, excited to pick up the leftovers. 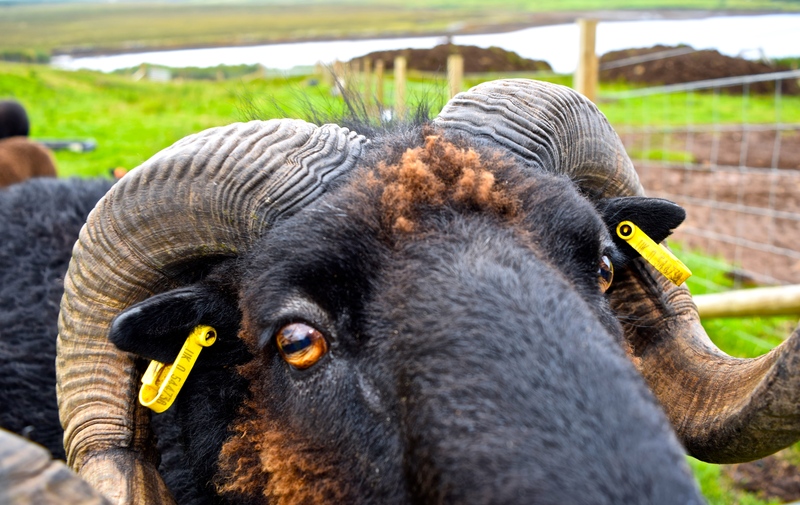 The sheep were absolutely beautiful and after spending day after day driving through Scotland and seeing thousands of these creatures, it was so amazing to finally get up close and personal with them! I’m not going to deny it, it was a major highlight of the tour! 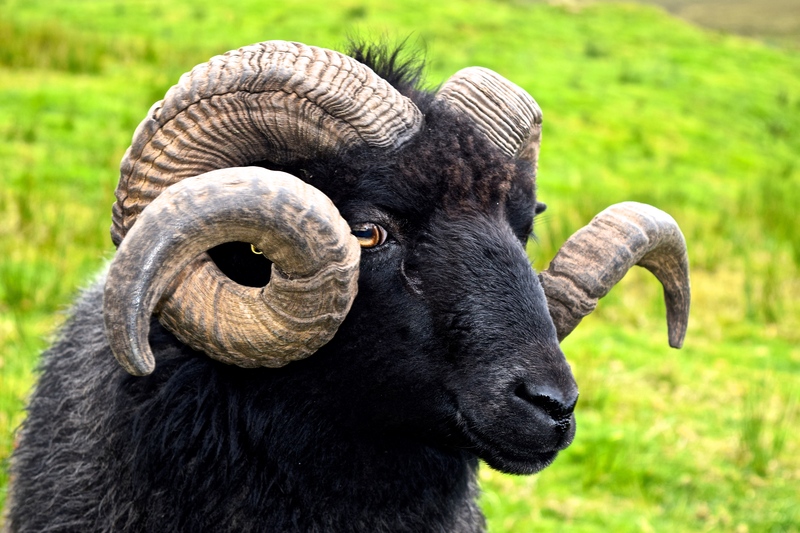 The crofter told us all about his sheep, and showed us who was in charge – a beautiful burly fellow they named ‘the big guy’ with a stunning set of horns. We eagerly held out our hands full of feed and laughed as their tongues tickled our palms as they flicked up the food to their mouths. They were greedy and hungry, butting each other off to get at our handfuls of food. The big guy in charge head butted another one right in the gut! One of the sheep moved off and took a few licks of water from a trough, and the crofted told us we all just witnessed an incredibly rare thing – a sheep drinking! I wasn’t sure if he was joking or not, but turns out sheep nearly never need to drink water because they ingest so much of it from the rain soaked grass they eat all day! The chickens plucked up whatever bit of feed that fell from our hands to the ground and and fluttered about noisily trying to keep out from under the sheeps powerful hooves. We lingered petting the beasts, feeling their thick soft wool and admiring their strange, bright rectangular eyes. I nearly had to be pulled away from them and brought back to the van, I just didn’t want to leave!!! I bid a sad goodbye and decided then and there that I would one day have some sheep of my own! We were nearing the end of our tour, with only two stops close together left. First we headed to Kilt Rock. This was a huge rock cliff formation of vertical basalt columns on the mid eastern side of the isle that gave the appearance of a traditional kilt skirt. 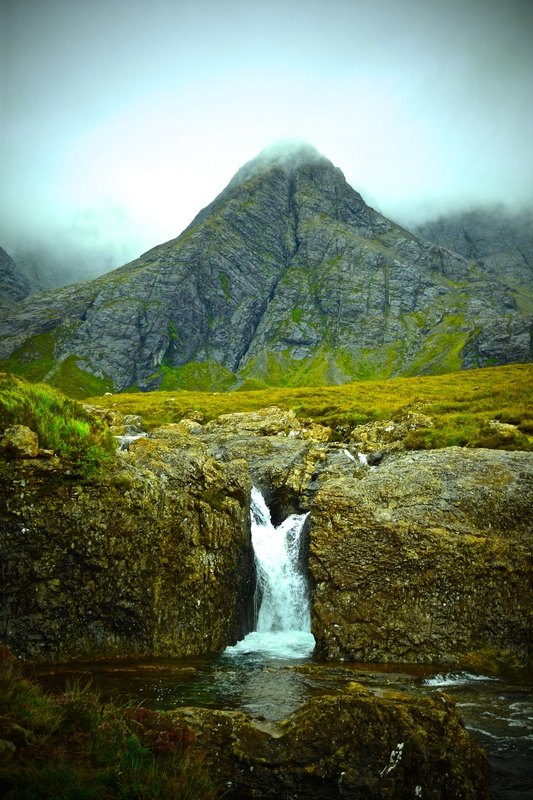 The narrow Mealt waterfall falls for 60 meters before misting into the Sound of Raasay below. As you stand on the platform on the cliff edge you can hear what sounds like far off bag pipes playing – it’s really the wind playing tricks on the metal tubes of the platform, but it sounded beautiful, haunting and ethereal. On the the other side of the platform we were afforded the spectacular view of more basalt column formations sloping down into the ocean, half covered in moss. Our tour was coming to a close and I felt as if I had only grazed the surface of what the Isle of Skye had to offer. This isle had grabbed me by the soul and ignited a fierce love for her inside me. I had to see more. I had to explore more. 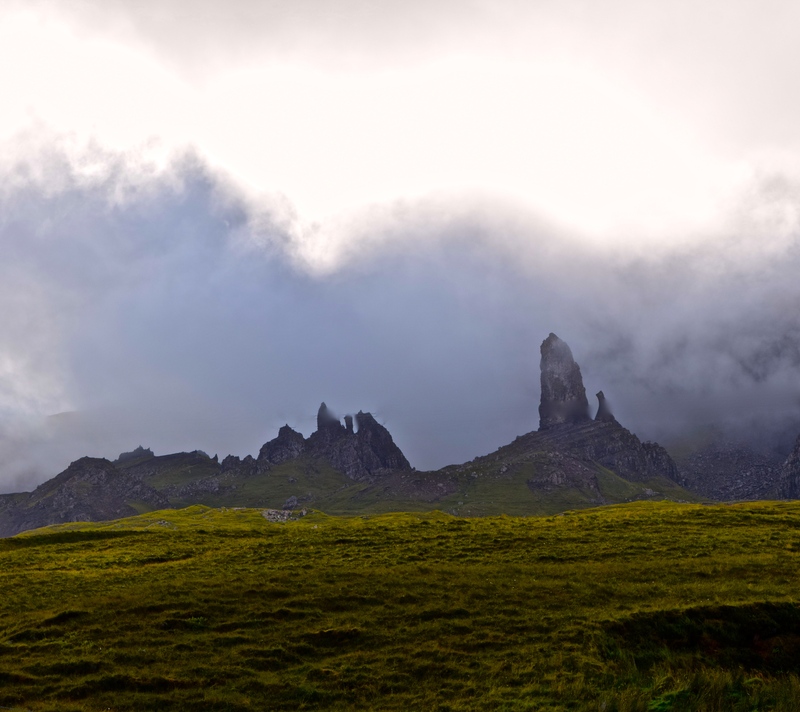 Our last stop on our way back to Portree was to see the Old Man of Storr which is actually a rare feat to do on the Isle, especially in late August, due to the constant heavy cloud cover. Our guide had been asking people through out the day if it was visible today and they said it was – while not the best conditions we were lucky enough to get a sneak peak a the distant rock formation standing tall. 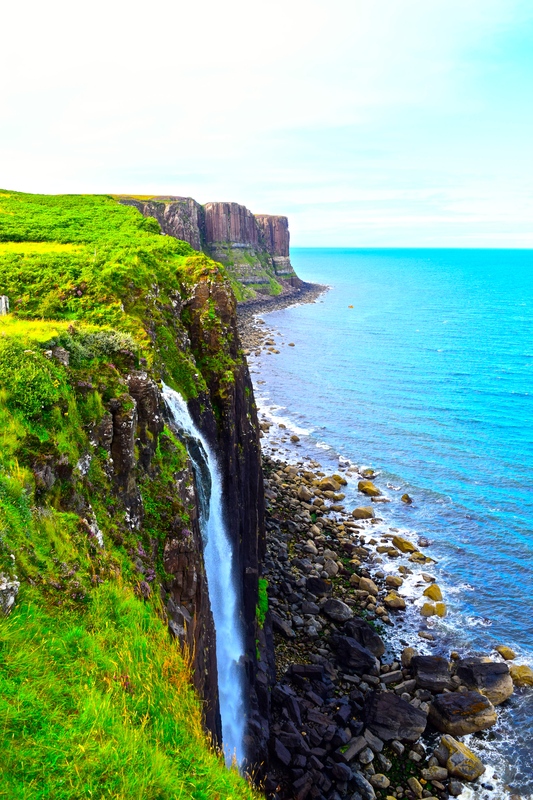 It can be seen from mies around and was formed my an ancient landslide, and is not an iconic landmark for Scotland. The grey clouds swam swiftly around the base of the pinnacle and we gazed on from a distance, away from the crowds. On my own time I would have gladly hiked the 4 km up and around Storr but of course we didn’t have the time for such an adventure. This tour solidified in me that this is the one place above all others I had visited that I must return to to do justice and explore fully. 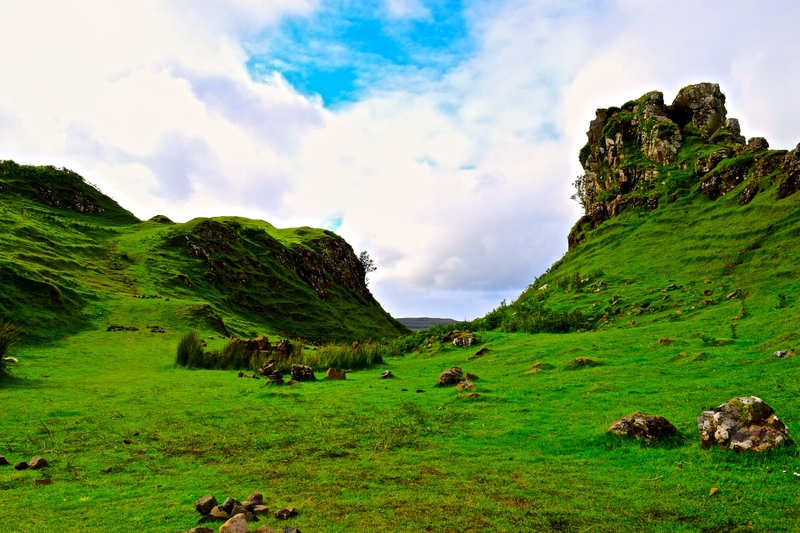 I was completely infatuated with this alluring land, I felt so at home here in the damp green grasses. The expansive, dramatic, lush landscapes of Scotland drew me in with an attraction so strong I could not resist. 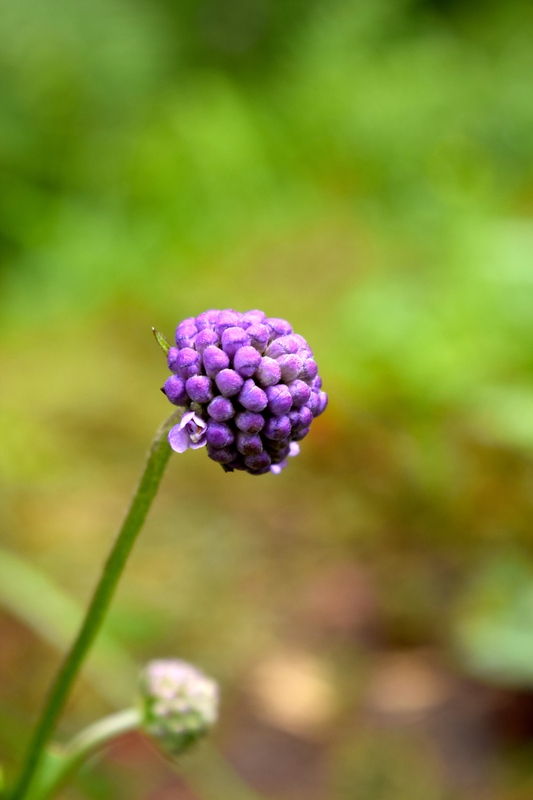 I never thought myself one for rainy places, but Scotland doesn’t rain incessantly for days on end – it will rain and minutes later the sun will be out and then it will rain again, and so on. The weather, like the landscape is ever changing. 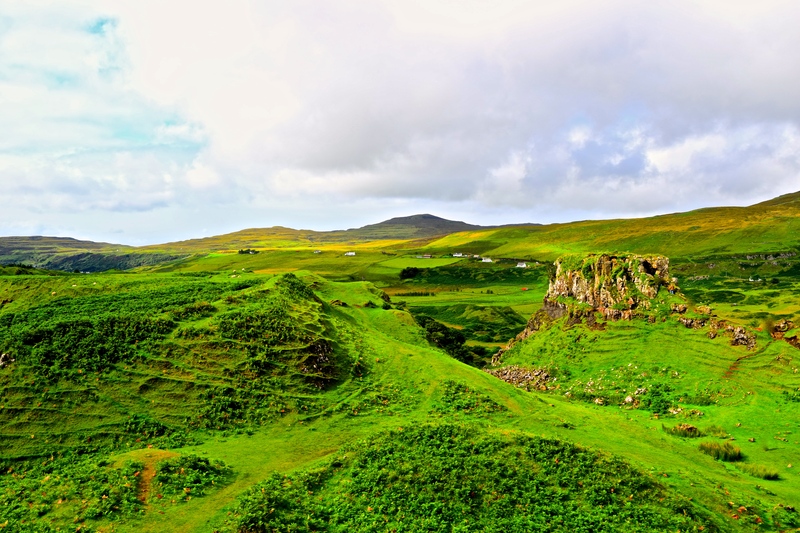 I adored the verdant green of the grassy knolls broken only by the white lichen covered rocks that dotted the land like age spots on the skin of an old man. I was in awe of the old forest graveyards, the bleached stumps of the long severed trees slumped like tombstones, their flaking bark the withered skin of long forgotten skeletons left to decay in the harsh winds and rains of Scotland. Make room for the sheep they said, clear the trees. 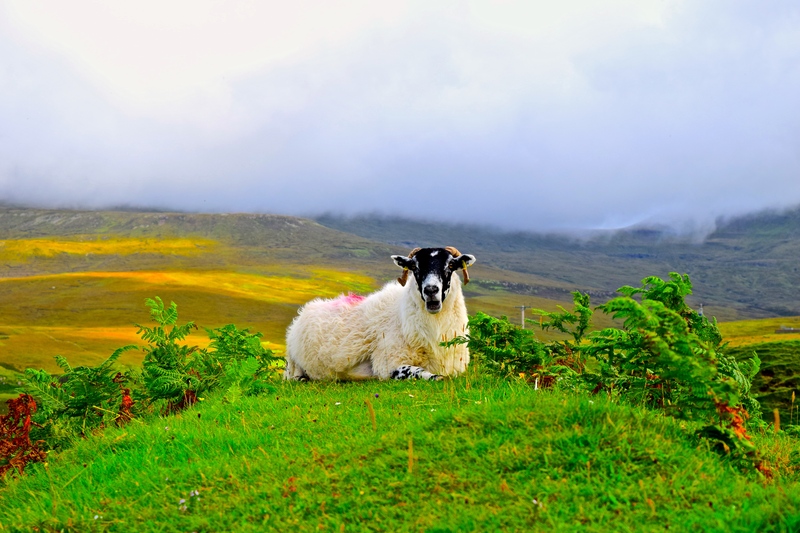 I cherished the sight of the thousands of white sheep, like the lichen rocks and tree stumps, dotting the green pastures with their fluffy backs. I admired in wonderment the harsh and dramatic mountains, rising up out of the grasses like the backbone of some ancient dinosaur. The old man makes a rare appearance for us. 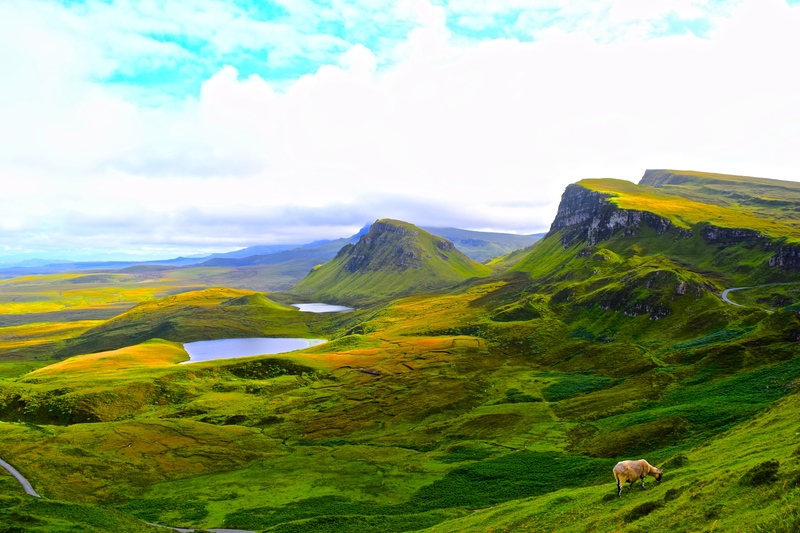 My dearest Scotland… you’re all brooks and streams, mountains and sheep. You’re lush green glens and grey moody skies, purple heather, yellow gorse and violet fire weed. You’re crumbling stone bridges and ancient rock walls, salty mists and icy gales, lichen shrouded rock and spilling cascades. You’re a maze of alluring lochs and enticing isles. You’re absolute paradise.